Two daring Ohio great-grandmothers jumped from a plane Saturday to help raise money for a veterans' food pantry. 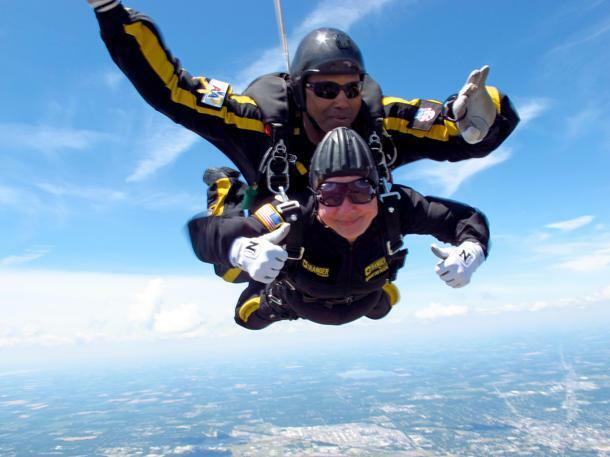 Marjorie Bryan, 83, and Marianna Sherman, 82, parachuted from more than 10,000 feet at the Allen County Airport in Lima, reports the Lima News. They jumped in tandem with retired Sgt. 1st Class Michael "Big Mike" Elliott, who has made similar jumps with former President George H.W. Bush on Bush's 83rd and 85th birthdays. After the jump, safely on the ground with a glass of champagne in her hand, Bryan said she wants to join Bush if he makes another jump for his 90th birthday. "I'll be 85, and I want to go with him," she said. Sherman was less certain about returning to the skies. She said the view was breathtaking, but the ride was a little uncomfortable. "Not if I wasn't asked," she said with a smile. Bryan and Sherman made the jumps to raise funds for a local pantry run by the Blue Star Mothers of America, an organization of women whose children have served in the military.